Kemet - goyur group, inc. The Nile River is the source of life where humanity is concerned with most people originating from south of the Nile and spreading outward and most civilizations throughout history have typically congregated near water. This land, like Yisra’el (Israel) used to be fertile and flush with life instead of the arid wasteland it is today. The sons of Kham (Ham) migrated and set up lands for themselves with one of Kham’s sons Mistrayim ruling what is today called Egypt. King Menes I (the embanker) created Upper Mistrayim (Upper Egypt) by embanking the Nile because the upper portion of this land was flooded (Edwards, IES 1971, "The early dynastic period in Egypt"). The Nile River is the only one in the world that flows from south to north and it empties into its delta which became the inhabitation for the people of Yisra’el in the land Avaris during the Middle Kingdom periods (2134-1690 BCE) prior to their captivity in that land in the same period. During the early history of humanity in the pre-dynastic era (5500 – 3050 BCE), these small tribes residing along the Nile valley had developed into a series of varying cultures deriving from their forefathers and exhibited a firm control of agriculture and selective breeding. All the children of Kham settled in this region except one, Kena’an (Canaan) and each culture can be identified by their pottery and daily use items, like combs, bracelets, and beads. The largest of these early cultures in upper (Southern) Khamet was the Mistrian (named Badari after where it was found in El-Badari, Asyut), and originated further in what is now the desert region and is identified by its high quality ceramics, stone tools, and its use of copper. Egypt in the Scriptures it is referred to as Mistrayim, one of the four sons of Kham, son of Noahk. As was typically the case for eastern people, they would name their lands after a progenitor or famous ruler. 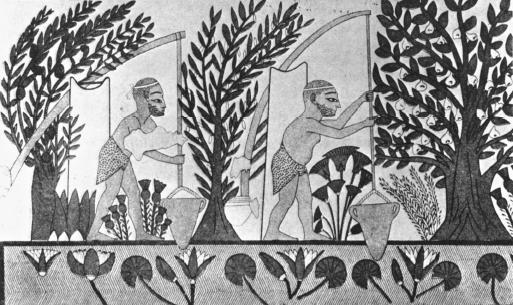 When studying antiquity it is learned that the first ruler of the land was the one credited with forming the lower and upper portions of the kingdom and he was called Narmer. In eastern thinking cultures, individuals changed their names based on events or locations such as Abram (meaning father) changing to Abraham (meaning father of multitudes) as well as Ya’aqob (Jacob) which means heel grabber because he was born grasping the heel of Esau being changed to Yisra’el (meaning El contends with). So this Narmer is almost universally credited with the formation of north and south Egypt by embanking the northern part of the Nile River somewhere around 3000 BCE and thus created the north and south. In scripture the name Mistrayim means embanker of the water and while it is not universally accepted that Menes and Narmer are one in the same, it is recognized that the term of Menes was a title and probably not actually the name of the first ruler. To the children of Kham he was known as Narmer, but to the children of Shem he was Mistrayim. The Narmer Palette is a famous relief found by James E. Quibell in 1898 in Hierakonpolis and it clearly displays Narmer with the insignia of both Upper and Lower Mistrayim which is proof in the archeological record of him unifying the two kingdoms (Edwards, WB 1961. Archaic Egypt: Culture and Civilization in Egypt Five Thousand Years Ago. London: Penguin Books). ​Like every other great civilization of the world, Khamet had its moment as the center of the world and the advances in culture/agriculture, governance, and theology shaped the world the same way that Mesopotamia did before them (around 4500 BCE) and the Greeks did after them (around 440 BCE). Khamet and Yisra’el have a destiny that has been intertwined for the ages and just like two brothers, the children of Shem and the children of Kham have leaned on one another and helped each other grow as a people. As stated, most of the scientific community and the general public do not believe that the events, people or places from the Scriptures are grounded in reality. People assume that humanity was so primitive that they could not possibly have a frame of reference to the things that they were seeing. This train of thinking makes two great assumptions that are not based on logic; The first is that the people of the ancient world were primitive and ignorant of the reality around them. How can this be true when everything that humanity does from its governance to science and even theology came directly from the ancient world with most of their achievements still unable to be duplicated or explained even to this day? The second assumption is that the ancient world made up stories and the modern world has a firmer grip on reality and thus is better suited to discern events of thousands of years ago. If this is the case then why is science and archeology finding so much evidence that reproves what ancient civilizations wrote about the world they lived in? This is the coin of Yosef, found in an excavation, naming him as viceroy. 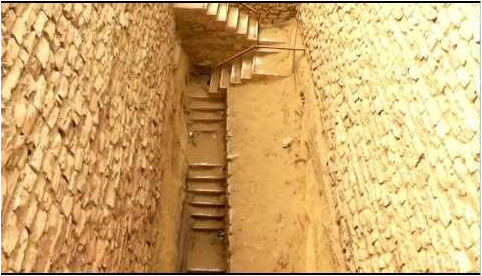 In the case that many in mainstream archeology make of Yisra’el never actually being in Khamet, there is much evidence to the contrary outside of the Scriptures, but let us first examine the Scriptures. ​While it is clear in the Scriptures that Yoseph ruled in the land of Mistrayim, there is also evidence of his presence found in antiquity within the region. A coin was discovered in 2009 that has the name of Yosef twice on it, written in hieroglyphs. It is written once as his original name Yosef, and again as his the name Saba Sabani, which was given to him by Pharaoh when he became the treasurer. There is also an image of Yoseph as the viceroy doing administrative duties at the time. ​In order for the Scriptures to be true, such a massive undertaking involving the gathering and storage of enough grain to last for seven years would have to be recording by the people of the region, and it was. In 2008 an expedition by the University of Chicago at Tell Edfu in southern Mistrayim (Egypt) discovered a huge administration building and silos. These grain bins are located in a large silo courtyard estimated to be of the 17th Dynasty (1630-1520 B.C. ), they are comprised of at least seven mud-brick silos and boast a diameter between 5.5 and 6.5 meters, making them the largest examples of a silo system inside a town center to date. There was also another a mud-brick building with 16 wooden columns of earlier origins that contained pottery and seal impressions found in the hall that allow for estimates to date it to the early 13th Dynasty (1773-1650 B.C.). Dating anything in Mistrayim is difficult and any reputable archeologist would agree that we know very little of the dates and times associated with the culture. These findings were reported in the New York and Chicago times. ​The original beliefs of Ancient Khamet, Mistrayim (Egypt) in particular, from predynastic era (4000 BCE and earlier) differ somewhat in comparison to the later dynastic periods and mark the disappearance of the indigenous culture prior to the early BCE era (Encyclopedia Britannica). The people of Khamet were eastern thinking people and thus their words and names of their deities were in the function of verbs and took on the action of personage of the gods. They believed that nature itself was divine and the many forces of nature were represented by different gods and is the very definition of paganism and possibly where it started (see paganism page). There were two forms of the mysteries practiced in Mistrayim, polytheism (worship of many gods) and monotheism (worship of one god). 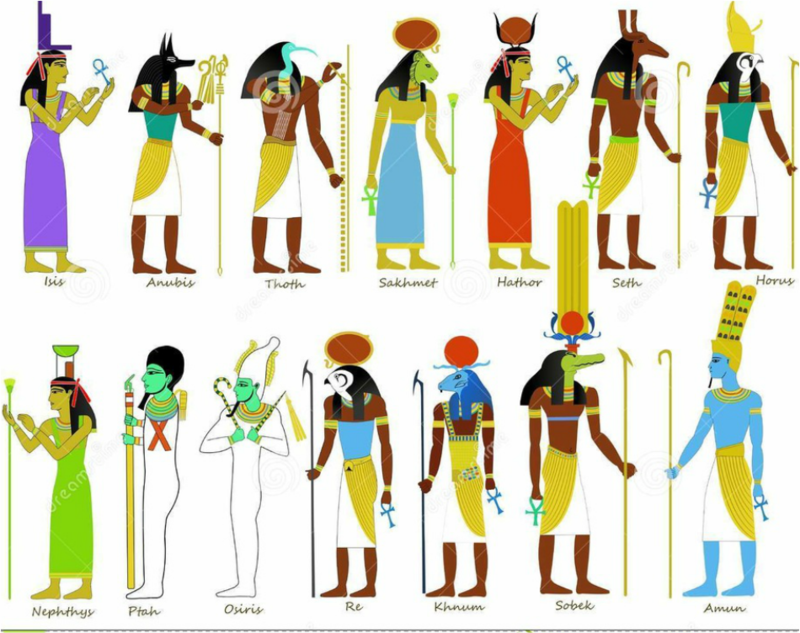 The monotheistic belief system in Mistrayim was practiced a short period during Akhenaten’s reign and a portion of his son’s, Tutankhamun (King Tut), thus polytheism was the prevailing form of the msyteries. To understand the form of mysteries practiced in the dynastic era of Mistrayim it is pertinent to first understand how the mysteries of Mesopotamia got interwoven into Khamet. The Kingdom of Nimrod/Tammuz/Gilgamesh of Kush (Cush, son of Kham, father of all in the land of Khamet) conquered and then ruled over Ancient Mesopotamia as described in the Book of Yasher (Jasher) 7:34 “And when Nimrod was forty years old, at that time there was a war between his brethren (sons of Kush) and the children of Yahphet (Japheth), so that they were in the power of their enemies." ​While the area was estimated to be first permanently settled between c. 5500 and 4000 BCE by the children of Yahphet, which most modern historians refer to as a western or Asiatic people ("The Ubaid Period 5500–4000 B.C." In Heilbrunn Timeline of Art History. Department of Ancient Near-Eastern Art. The Metropolitan Museum of Art, New York October 2003), the children of Kush conquered them and formed the kingdom of Sumer at a later time and after a considerable amount conflicts. The dynastic period of Mesopotamia began about 2900 BCE and includes such legendary figures as Enmerkar and Gilgamesh (both are the same person, Nimrod) and cuneiform records state that he reigned shortly before the historic record opens around 2700 BCE after the expansion of Sumer. (Algaze, Guillermo 2005 "The Uruk World System: The Dynamics of Expansion of Early Mesopotamian Civilization", Second Edition, University of Chicago Press). ​The earliest dynastic king on the Sumerian king list (Edwards, IES 1971, "The early dynastic period in Egypt", The Cambridge Ancient History 1, Cambridge: Cambridge University Press.) who is referred to in other sources of antiquity is Etana, 13th king of the first dynasty of Kish (variation of Kush). The first ruler and the first king of a civilization that is authenticated through the archaeological record is Enmebaragesi (Enmerkar) of Kish, whose name is also mentioned in the Gilgamesh epic. This leads many to assume that Gilgamesh himself could have been a historical king of Uruk, but with some research into Hebrew and Akkadian antiquity, it is clear that they are one in the same. As described within the Epic of Gilgamesh, this period in history was engulfed in war with many cities becoming walled and increasing in their size and Gilgamesh is credited with having built the walls of Uruk. The undefended cities and villages of southern Mesopotamia (modern day Yemen) disappeared. The Book of Yasher supports this account of history in 8:42 “And while he (Nimrod) was reigning according to his heart’s desire, after having conquered all his enemies around, he advised with his counselors to build a city for his palace, and they did so. The stories of the Ancient Khamet “gods” is viewed today as Egyptian (Mistrian) mythology. This is a collection of myths from ancient Khamet that describe the origins, actions and motives of the “gods” of Khamet and used to decipher their meaning as well as the meaning of the world. The beliefs system tied to these myths are what formulate the culture of Mistrayim and vital in understanding their forms of the mysteries. Myths appear frequently in the writings and art of the land of Khamet and are particularly detailed in various short stories and religious material in the form of hymns, ritual texts, funerary texts, and temple decoration. These sources rarely contain a complete account of a myth and often describe only brief fragments.